It’s about time an approachable gospel album existed. Wait, did you think we meant the swaying, Jesus praising, Lord-seeking kind of gospel? Nope. While that is generally what is meant when talking about this genre, there’s no Jesus praising or faith-based lyrical references at all here. What we mean is the genre that makes your heart feel warm, has some incredible backup vocals and is, well, unmistakably heavenly. 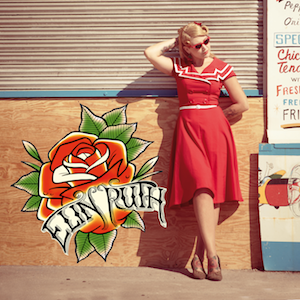 Elin Ruth’s self-titled album starts off with a bang. Literally. “Bang,” the first single, lets us know Elin Ruth means business. By her first lyric, the Swedish singer-songwriter already has us in love with her. This album reads like a Swedish girl in love with American music—alluding to aspects of soul, gospel, bluegrass, country, and pop, all of which she does quite masterfully. Our favorites are “Bang” and “Higher (Supermom)” in which the choir in the background highlights her smoky tenor and allows the music to truly reach out and touch our souls, just as gospel was meant to. Her style is familiar, but not in a way that makes us think we’ve heard the same rendition from four million other artists, although it does vaguely remind us of a unique combination: Aretha, Joni Mitchell, and Sheryl Crow. It’s her unrestrained heart and soul that shines through and raises the question: what were we listening to before this album? We’d give this chills-worthy album three thumbs up (if we had three thumbs)! Radiating love and light, we’re ready for anything else Elin Ruth will throw our way.